Last weekend Lotus Malaysia has unveiled a special Chrome Lotus Evora which it’s also feature in the upcoming movie “The Host” which is from a novel written by Stephanie Meyer ( the author who wrote “The Twilight Saga”). Lotus Owners Club Malaysia also participated in the event. 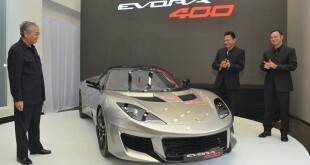 75 cars from various Lotus models gather at the Lotus Flagship Showroom & Center in Sg. Penchala, Damansara for a convoy to Kuala Lumpur. The chrome Lotus Evora, as seen in the movie driven driven by Natasha Seatter – a Malaysian racing sensation led the all the Lotus cars convoy to Pavillion KL for a special movie screening of “The Host” as well as some photo session. Lotus has a strong cinematic history; with appearances in two ‘Bond’ films – in ‘The Spy Who Loved Me’ out-racing a motorbike and helicopter before taking to the sea as the iconic submersible Esprit, and in a cool role in ‘For Your Eyes Only’; “cornering like it’s on rails” with Julia Roberts at the wheel in ‘Pretty Woman’; and taking part in an adrenaline fuelled chase sequence along the San Francisco coastline with Sharon Stone in ‘Basic Instinct’. ‘The Host’ follows the plight of ‘Melanie’ played by Irish actress Saoirse Ronan as she battles an unforeseen enemy lead by the ‘Seeker’ played by Hollywood favourite Diane Kruger. A romantic action-adventure which sees Melanie join resistance fighters as they battle for the survival of the human race, ‘The Host’ is a tale of spirit, individuality and determination – traits that echo Lotus’ own character. Negotiations for a “hero car” for the movie started in early October 2011 and by the end of the month Lotus had agreed to provide a number of Evoras to the project directed by its screenwriter Andrew Niccol who was looking for an extraordinary car for the role. The Lotus Evora was chosen for its stunning and futuristic aesthetic, which when juxtaposed with contemporary locations, gives a truly alien element to the Sci-Fi movie. In conjunction of this Hollywood block buster movie, public will have a chance to view the Chrome Lotus Evora up-close. The Chrome Lotus Evora currently on display at Level 3, Couture Pavilion from 1st April 2013 until 10th April 2013, and later the car will be displayed at IPC (Ikano Power Centre) Shopping Centre, Mutiara Damansara from 11th April 2013 until 28th April 2013. The Chrome Vinyl Wrap Lotus Evora with special-effect lighting is driven by the “baddies” in the movie to get rid of human race from earth by overtaking the human physical body and erasing the memories of human mind.Check out the movie trailer “The Host” below and get a glimpse of the chromed Lotus Evora in action before you head to the cinema.